When you customize your gift with a big personalized teddy bear like Brownie Cuddles 48 inch, your loved one with smile with joy! Brownie loves to delivery special messages all over the world. When you personalize his t-shirt, Brownie, will deliver it with a hug! Brownie has the softest chocolate brown fur and sweetest eyes that twinkle. He's also a very big teddy bear, measuring at 48 inches! The t-shirt that Brownie wears a cute red heart at the top that will look great with your message. You can write the personalized note of your choice, up to 5 words. A lovely customized teddy bear like Brownie Cuddles makes the best gift for all ages! Included with your personalized giant teddy bear order is a matching greeting card that also contains your custom message inside! 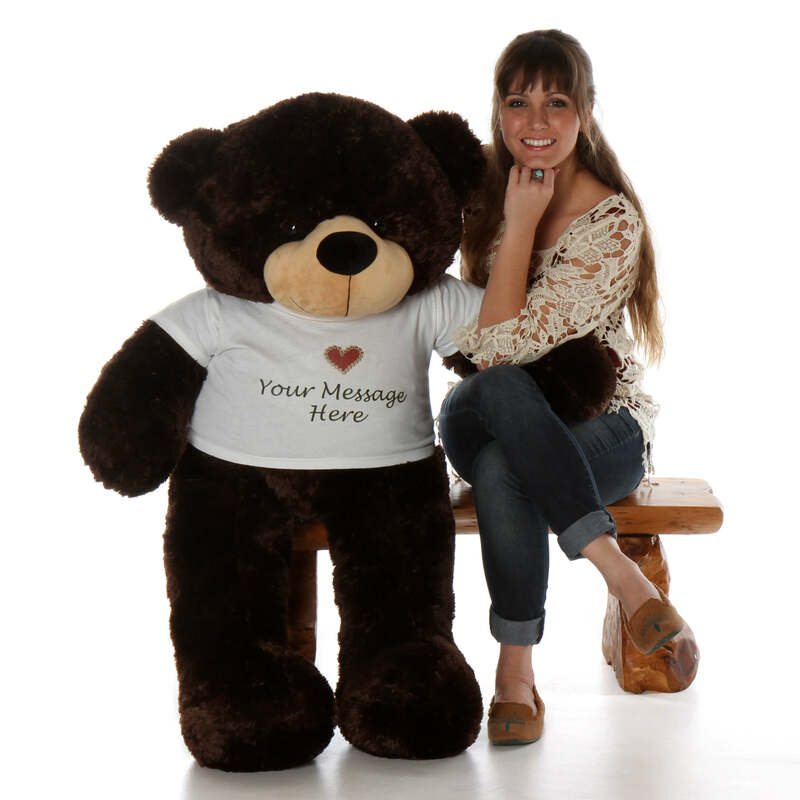 Personalize any bear with our custom T-Shirts! I'll definitely be getting another one...but this time I'm going to get her an upgrade...Maybe we should go full 6ft, so the bear is bigger than her! Awesome gift for that special someone! The bear does not disappoint! It is a truly unique and wonderful gift to give to someone you care a lot about. I was blown away by how it felt, so soft and the craftsmanship is superb! Teddy arrived early! He is perfect and she tells me that he is a hit in the office!! This teddy will be a therapy bear!!! I bought this bear for my brother after he had minor surgery.He was so happy and excited to get it.When I saw the bear the quality exceeded my expectations! Quality Bear - Awesome Personalized Shirt! No complaints! The best bear ever! We ordered a personalized shirt and he was here in a matter of a few days. Quicker shipping than expected - quality product, excellent service. Nothing but applauds! PERFECT BEAR!! Not too big but not too small. I got it as a gift for a friend and immediately after seeing it she fell in love with how soft and cuddly the bear was. A must buy for someone special.